I love the idea of adding some food posts to this blog. It is a big part of the health and happiness of a family. Alas, I am not a food professional or a fantastic photographer of food… so I don’t think I could do just a food blog. I DO however, have many opinions about food, a love of cooking and eating and have a strong desire to teach my children how to appreciate (even if they don’t like) all foods. So, I have decided to do Future Foodie Fridays… one or two posts a month talking about favorite recipes and rating the Family Friendliness of restaurants. I would also like to say, these are the opinions I have for how MY OWN family eats, it is what we like and what works for us. I don’t judge others for their own choices. My sister would probably disagree, but food and how my children eat it is one of the few topics I am pretty openly opinionated about. (notice I used the word “few” so that I won’t be called out in the future) As stated in my About section, I am uncomfortable in extremes… this includes how we eat. We will never be just a vegetarian, carnivore, paleo or strictly local & organic. I love it all and see the benefits in most. What I feel strongly about is that our diet is diverse. That my children know where it is from, and appreciate how we came to have it on our table. It is also important to me that my children know what they like about food, why they don’t like a food, and how to eat foods that they don’t love. Tall order right? Don’t get me wrong, we don’t always eat “adult” gourmet and kale at home, far from it. There is a time and place for mac and cheese, corn dogs and frozen pizza. When we are at a restaurant or when everyone else is eating something else, is not it. Often times, our lunches are “kid” food and they eat what we are eating at dinner time. When we take them to restaurants with different ethnicities, I don’t want them eating $6 easy mac or a microwaved burger. So, we don’t give them the option. We are trying to teach them how to develop a palate for more. I will never forget how embarrassed I was at myself the first time I ate with my mother in law. She made a lovely Succatash but it had mushrooms… (my longtime foe) I at age 19 told her that “I don’t like mushrooms.” and proceeded to pick them all out (they were tiny) and eat around them. My mother in law being who she is, informed me that it was rude and her children were not picky. Which was true on both accounts. I started to learn that day that I needed to grow up taste wise and that what I had done was really insulting to her. If someone honors you by sharing their meal with you… you eat the damn food. That is why I would love for them to learn the skill of eating foods they don’t love and be thankful. Plus, our palates are always changing and who knows, maybe someday I will actually LIKE eggplant… not just appreciate the preparation of it. I wouldn’t want to miss that occasion by never trying it again. Okay, my food rant is done for today. For Today. On to my little future foodies. Little Boy Loes (LBL) is my maybe vegetarian. This kid will eat platefuls of raw veggies and rice, but meat is more of a struggle. For some reason he prefers formed meats which is okay, just eating a little more snout to tail right? He also LOVES asian foods and is happiest in a chinese or indian restaurant (if not eating american). His favorite indian dish is malai kofta and he is a big fan of sesame chicken. Littlest Loes (LL) is my carnivore. For her birthday this past December she requested meat lollipops. AKA Lamb chops. Getting her to eat her veggies is our puzzle with her… although lately I have been finding that if it is juiced, she will drink it. I think it is the magic word “juice”. LL is more into American and Italian fare. Her favorite foods are smoked fish, cheeseburgers, mac n cheese and pizza. She also loves soup and chose this week’s recipe. A couple of weeks ago my mother in law had a hip replaced so we are taking her some soup this weekend. LL chose clam chowder. She loves eating it and really loves going to the fish market! We try to go to Coastal Seafoods usually. She likes to see the pretty scales on the whole fish. Today she was especially enthralled with a whole Atlantic Salmon and asked, do I eat that fish? We then walked to the cut section and I showed her the salmon fillets. She responded with oh, the pink one! I love the pink one. Awesome! So we bought our 7 lbs of clams and were on our way. We will scrub the clams this afternoon and make the soup tomorrow. The recipe however, I will share today! I especially love making soup. There are lots of opportunities for the kidlets to help and it is such a warm, rich, and delicious enjoyment when it is done, and soup, only gets better the next day. From Cook’s Illustrated. Published March 1, 1998. Serves 6 (about 2 quarts). During spring and summer, shellfish spawn, leaving them weak, perishable, and off-flavored. 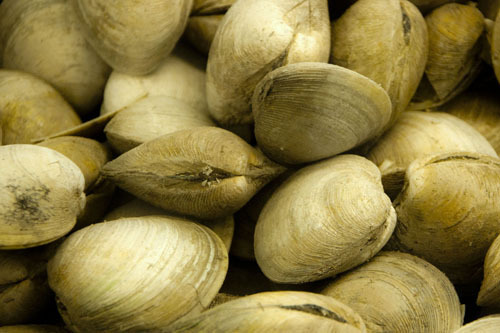 Although clams recover from their spawning phase more quickly than mussels and oysters, they should be avoided from late spring through midsummer. 1. Bring clams and 3 cups water to boil in large, covered soup kettle. Following illustration 1, below, steam until clams just open, 3 to 5 minutes. Transfer clams to large bowl; cool slightly. Following illustrations 2 and 3, remove clams from shells by opening clams with a paring knife while holding over a bowl to catch juices. Next, sever the muscle from under the clam and remove it from the shell. Reserve meat in bowl and discarding shells. Mince clams; set aside. Pour clam broth into 2-quart Pyrex measuring cup, holding back last few tablespoons broth in case of sediment; set clam broth aside. (Should have about 5 cups.) Rinse and dry kettle; return to burner. 2. Fry bacon in kettle over medium-low heat until fat renders and bacon crisps, 5 to 7 minutes. Add onion to bacon; sauté until softened, about 5 minutes. Add flour; stir until lightly colored, about 1 minute. Gradually whisk in reserved clam juice. Add potatoes, bay leaf, and thyme; simmer until potatoes are tender, about 10 minutes. Add clams, cream, parsley, and salt (if necessary) and ground pepper to taste; bring to simmer. Remove from heat and serve. 1. Steam clams until just open, at right, rather than completely open, as shown at left. 2. Open clams with a paring knife, holding over a bowl to catch juices. 3. Sever the muscle under the clam and remove it from the shell. Nobody before you have children ever tells you that one of the more stressful chores for a parent is getting our lovely kidlets to school on time, but this subject alone could be fodder for a whole different post. 🙂 Yesterday, as I was getting LL to her preschool, the lack of common sense in other drivers (slushy, icy roads), the fact that the membership drive was still happening on The Current ( I just want to listen to music), and the constant why mama, why mama, why mama from the backseat made for a very tense drive. Thankfully, I was able to hold in the vocal side of my agitation in front of LL. Anyway, I finally got her settled into school, had a nice chat with her teachers and got back in my car. As I pull away from the school I received a very clear palm to forehead moment from the universe… as Elena Brower would say, a “Mindful Smack”. I had turned up the radio and noticed a great song playing, finally a break from the talking… as I continue to listen, I try to place where I had heard this song, who sings it. Suddenly, I remember, and my eyes begin to well. It was Clouds by Zack Sobiech. Have you heard of him yet? 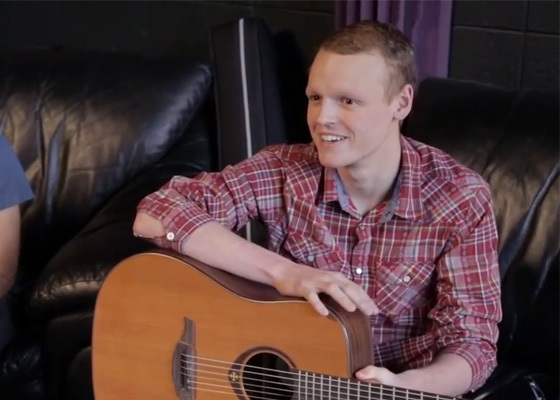 He is a 17 year old boy here in Minnesota that was diagnosed with terminal cancer. He wrote this song and posted it to You Tube as his goodbye to his loved ones and to raise awareness of childhood cancers. Also, I am sure he is enjoying his moments of rock stardom, who wouldn’t! Uff Da, there it was, that smack to the forehead… the reminder that I am in a very happy and healthy chapter in my story. Thank you Zack Sobiech for sharing your story and for your beautiful music. At this time last year, I was preparing to leave for Scottsdale for the second week of my teacher training. It was two weeks filled with many moments, stories and characters, but the moment that I have been repeatedly thinking about lately is the morning practice on I believe our second day. I studied with the amazing Martin and Jordan Kirk. Martin was leading this particular practice. He started the class with the story of Hanuman helping to rescue Sita from a land across the great dark void called Lanka (a wonderful story for your kidlets if they enjoy adventure and super heroes). The story and the telling of it was spellbinding but what really stuck with me from it was when Martin then explained that in the stories of the Ramayana and of the Mahabharata, we are meant to be able to relate to ALL of the characters because we are ALL of the characters. The characters are different aspects of ourself. The reason I have been coming back to this idea is that I have been really aware of the stories of others lately. Many joyful, some scary, some sad, and a great many just chugging along. I am a little awed by the idea that I may be a character in those same stories someday, or have been in the past. It also came up for me when I was trying to explain to LBL that war/conflict isn’t as simple as bad guys -vs-good guys. Everyone believes themselves to be the good guy fighting for what they believe in. Which makes it more complicated that just good and evil… I just heard an interview on MPR with Kevin Spacey, he was talking about his new show House of Cards. One of the subjects that he discussed was that he really liked roles where it isn’t clear if you liked him or not. There are many shows out there right now where the main characters are morally ambiguous. A single mama selling drugs, a cop that is also the serial killer of serial killers, the mobster that also loves and cares for his family… the list goes on. If a show, movie, or book are written well, we can emotionally connect to many different characters because we can see ourselves in those same roles. Just as we were meant to in those ancient texts in India. 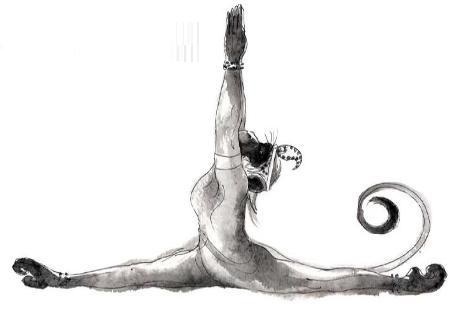 At some point in all of our lives we are Hanuman leaping across the void, the soldier wounded on a field, Lancelot falling in love with his best friend’s wife, the wolf hiding inside of grandmother, the lover, the spectator and the narrator. I would like to think that believing in that idea may help to understand others and their actions a little more clearly and compassionately and to help us to remember that if we are unhappy with our current character, maybe it is time for the story to change. YES!!! To all of those questions! When we finally took the time last week to really think about these questions… we realized that she grew up to her new age a little faster that we were ready for. In the last 5 months she has seemingly shed all of the last vestiges of babyhood, and we are just now catching up. Potty learning in October, starting school in September, learning to make friends for herself, knowing enough words to have the most lovely and sometimes not so lovely conversations with her brother, and giving up her pacifier and turning 3 in December. So much change and exploration. That being said, I think that one of the things that I was also reminded of this month was that 3 is a hard year for me personally to deal with. Not a baby, but yet not quite able to communicate like a bigger kid yet. A year of transition, and the universe knows that I am not always the best at transition. So how can I help myself and LL move through this first of many transition year in a mindful and kind way? First, for me, remembering that it is okay to not be awesome in all areas of parenting and to go slowly. Allowing space for LL to explore who she is now and follow her lead, but also reminding her of boundaries. Second, feeling proud in the knowledge that DL and I have given her enough confidence in her foundation that she feels safe enough to explore. She knows that she will be loved, no matter what. That seems like a good beginning to me, even if she did get a head start. Let’s she what she creates in this year of chaos.